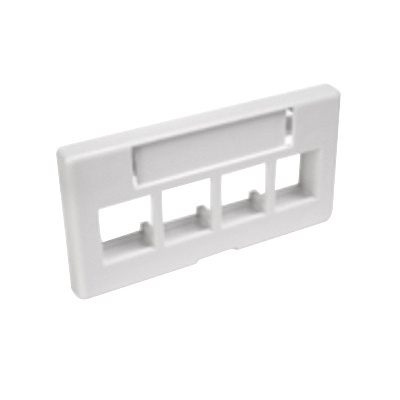 Leviton QuickPort® 4-Port Modular furniture faceplate with ID designation window, features high impact ABS plastic construction and is suitable for work area commercial-grade telephone and data patching. It has a dimension of 3.15-Inch x 0.45-Inch x 1.66-Inch. The rectangle shape faceplate is black in color and enables flush mounting. Wallplate is cULus listed and meets ANSI/TIA standards. Wallplate is cULus listed and meets ANSI/TIA standards.